The Chilko Experience is something you should add to your bucket list. Even if you have visited other mountain resorts, this will be something entirely different. You are staying in private, brand new, million dollar cabins, where you feel more like a personal friend than a resort guest. It is the perfect combination of 5 star accommodations, and the rugged outdoors. Days are spent on long or short ATV rides, boating, hiking, horseback riding, or fishing in the most awe-inspiring wilderness, and nights are spent getting pampered by the Huston’s and their staff, who genuinely want you to be overwhelmed by the experience. The story behind the Chilko Experience is more of a journey than a destination. Chatting with the Owner Phil Huston, he explains there was never a master plan rather an evolution of events. Now I can see how they interlaced to reach the present. It begin in 1977 when I was working for a company that had some financial difficulties and I thought it would be a good time for a walk about. I traveled the western US when a cousin told me I had to see Europe before I went back to work. In Europe I met a Kiwi who said Alaska was the most beautiful place he had ever been and it was a must see before returning to the grind. I crossed BC twice on that journey and on the return leg I picked up a hitch hiker north of Prince George and he told the Chilcotin was fabulous and the Dean river the best fishing ever. I bought $20 worth of groceries and headed west into the Chilcotin. After ten days of touring, fishing and visiting I had found a new home. In 2002 Phil and Anne I decided we would like our own cabin away from the main house. The owner of Pioneer had become my fishing buddy so I naturally went to him for the home. When asked to describe the property in three elements. The Vanderbilt & Muir combination runs deep at Chilko. Exceptional architectural design (Vanderbilt) placed in a supernatural pristine wilderness setting (Muir) yields the unexpected by products of good will and hospitality. People are excited to be here. Pristine, adventurous and lifetime experience. 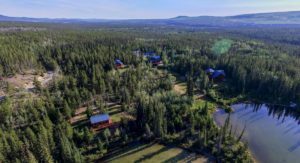 How do guests encounter luxury at the Chilko Experience? For most it would start with the facilities themselves. They are simply inviting. The main house is the nerve center of all functions. It is constructed of massive timbers recycled from a 1904 Kamloops grain elevator. One hundred plus year old timbers with their bolt and nail holes and the patina only age can produce emitted a warmth and charm that is difficult to describe. There is always coffee on the ready and a plate of fresh cookies or pastries available. If the chef is in the kitchen he will ask if you need anything special. There is six oversize leather chairs that engulf you and a library of local interests material plus maps galore. A big screen tv is near by with a movie collection as is WiFi for connecting with the outside world. The entire home is decorated with tasteful antiques and its easy to spent an hour looking a one of a kind objecst. If its early evening there are appies and drinks available. A guest favorite is a special locally brew beer in 20 oz frozen mug. Some prefer the 18 yr old single malt. All tastes are covered. Chances are that this might all happen on the deck will viewing snow capped mountains. After a chef prepared meal there is an outside fire and smores for those who wish it. It might be a game of cards or a cigar and a cognac on the deck before journeying back to their cabins. The point is there is everything to do and nothing to do so its OK to just chill if that is what one wants. Most CEO types that come do so with their families and in that setting its about being a great dad and husband or a son or daughter. If they come with clients, peers or staff its about bonding over an event they will remember the rest of their lives. Most people come expecting it to be like something they know. Its only natural. Its like Yellowstone or Glacier or Lake Louise but its not. 99% of golfer and happy with their local country club. 99% of outdoor types are happy with a house on a lake with a boat dock. However every golfer would like to play Augusta National once in their life. I tell people we are the Augusta National of Nature and its true. No one ever forgets a visit and for most its the trip of a lifetime. Some of the activities include – ATV rides, boating, kayaking, fishing, horseback riding,bear watching, ax throwing (yes you read correctly) and hiking. The Chilko Experience had it all. 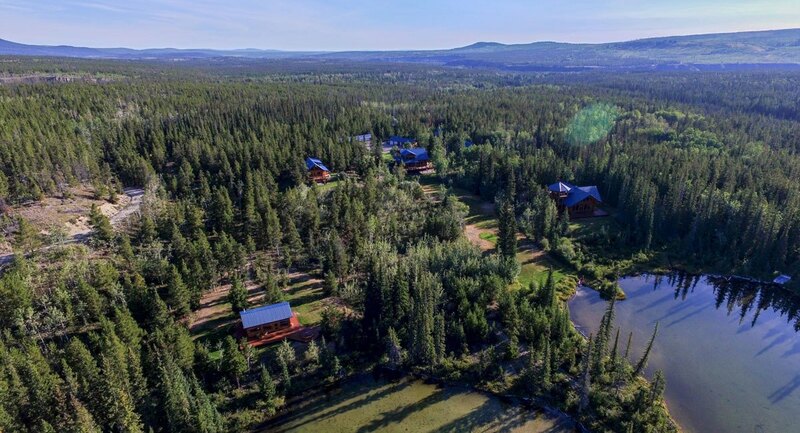 Some fun facts about Chilko is that it was constructed by the Timber King crew, as seen on HGTV. There was an episode that focused on some of the constuction as well. If nothing else, please take some time ot visit their website. They have an amazing 3D video that tours the property. if they say a picture is worth a thousand words, the videos are worth are worth a few more. Whether it is a an executive retreat or a family vacation for the ages, please consider the Chilko Experience. Worth every penny. I don’t think you’ll find he conversation lacking with your lovely hosts, Phil & Anne Huston. There is an interesting Omaha connection with Warren Buffet.